Although rarely done, states can sue to block a merger on antitrust grounds even if federal officials approve a takeover. State antitrust enforcers are expressing deep concerns that the proposed takeover of Sprint by Bellevue-based T-Mobile US could raise prices for consumers, signaling they might seek to thwart the deal. Some state attorneys general who are investigating the $26 billion transaction took the unusual step this week of publicly voicing worries that the combination could harm competition, offering insight for the first time into how they view the tie-up. Maryland Attorney General Brian Frosh, a Democrat, said that combining T-Mobile and Sprint would further concentrate an already consolidated industry by leaving just three national carriers. “That’s dangerous for competition. That’s dangerous for consumers,” Frosh said in an interview on the sidelines of an annual conference in Washington, D.C., for state attorneys general. The comments come after more than a dozen states joined to investigate the deal in parallel with the Justice Department and the Federal Communications Commission, which are nearing the end of their reviews. The tie-up has been widely criticized by consumer groups and Democratic lawmakers who want officials to oppose the deal. The states can sue to block the merger on antitrust grounds even if federal officials approve the takeover. The state group has hired economists, including University of California at Berkeley professor Carl Shapiro, to assist in its review, according to three people familiar with the matter. Economists could act as expert witnesses if the states sue to block the deal. Shapiro, who declined to comment, testified on behalf of the Justice Department in its unsuccessful lawsuit to block AT&T from buying Time Warner. Sprint declined to comment. T-Mobile said in a statement it’s having “good conversations” with states. “We will keep working closely with all state leaders to demonstrate the value of this merger for consumers they represent and how it is pro-competition,” the company said. The state attorneys general are particularly concerned about the impact of the deal on lower-income consumers, said one of the people. T-Mobile and Sprint compete for those customers and have been the most aggressive with lower-priced service plans compared to AT&T and Verizon Communications. A significant portion of T-Mobile and Sprint’s customers are pay-as-you-go or so-called prepaid subscribers. Those plans — sold by T-Mobile’s Metro brand and Sprint’s Boost and Virgin Mobile brands — tend to be purchased by lower-income consumers, or people with little or no access to credit. T-Mobile and Sprint combined would control about 42 percent of the prepaid market, according to data compiled by Bloomberg. TracFone Wireless would be second with about 32 percent followed by AT&T’s Cricket brand, at 25 percent. TracFone isn’t seen as a true competitor by the states because it resells wireless minutes that it buys in bulk from other mobile carriers and therefore depends on those companies to compete, the person familiar said. The companies argue that together they can create a stronger third competitor to take on industry leaders AT&T and Verizon. The centerpiece of their case is that they’ll be able to accelerate deployment of the next generation of wireless technology, known as 5G. 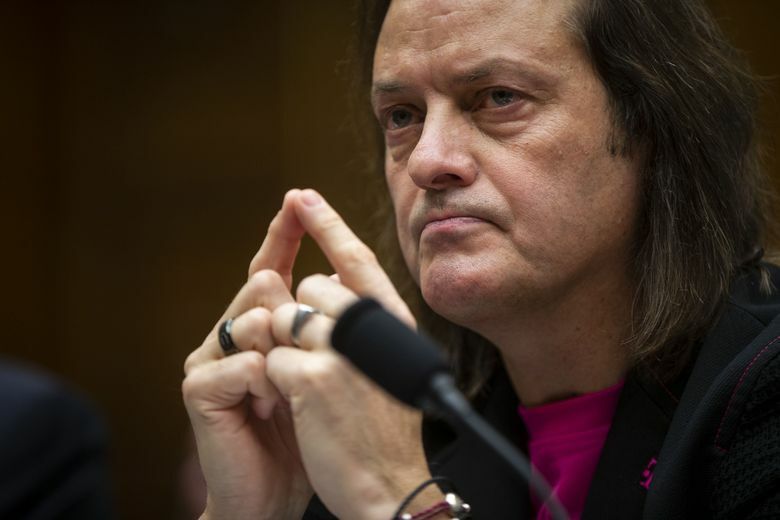 T-Mobile Chief Executive Officer John Legere last month promised that T-Mobile won’t raise rates after buying Sprint, offering consumers the same or better plans for three years. Analysts and deal opponents said Legere’s pledge might be a sign that the company has run into concerns from regulators that the merger will reduce competition and lead to more expensive phone bills. The attorney general of New York is leading the investigation with California, Tennessee and Florida, one of the people familiar with the matter said. Of the state attorneys general that have been disclosed in FCC filings as investigating the merger, most are Democrats, though there are a few Republicans. Because consumers spend a significant amount of their budgets on cellphone bills, the states want to make sure the deal is thoroughly vetted, particularly if the Justice Department decides not to challenge it, said the person. New York has dedicated a larger-than-normal team to work on the investigation, the person added. “These are two very important telecom companies in a field of four large ones,” Iowa Attorney General Tom Miller, a Democrat, who is among state officials examining the merger, said in an interview at the D.C. conference. State attorneys general often conduct merger investigations with the Justice Department’s antitrust division. When the U.S. sues to stop a deal, states will frequently join the case. It’s rare, but not unheard of, for states to challenge a deal when the federal government doesn’t. In 2017, California sued to stop Valero Energy from buying petroleum storage terminals from Plains All American Pipeline after the Federal Trade Commission cleared the deal. The companies later abandoned the deal.